We took a trip to Asheville, NC recently, and beyond eating a TON of great food, we finally made to Biltmore Estate. I wasn’t completely sure what to expect, but now I’m dying to return in warmer weather when the gardens and grounds will be in full bloom. However, Biltmore was all prettied up for Christmas when we visited, with a tree in nearly every room! Here’s some of my favorite photos from our visit. Biltmore’s incredible Banquet Hall at Christmas, with a 35 foot tall (real!) tree. I’m actually really loving the retro-ish tones of the Christmas decor in the hall. Biltmore’s cozy library (well, cozy for the scale of the house, the library alone is probably near the square footage of my apartment), with another huge Christmas tree. I’m not exaggerating when I say that nearly every room has a tree at Christmastime. Biltmore’s Tapestry Gallery, a long hallway with two fireplaces and 16th century tapestries depicting Christian themes. The gorgeous Winter Garden, all decked out for Christmas, and one of my favorite parts of the house. 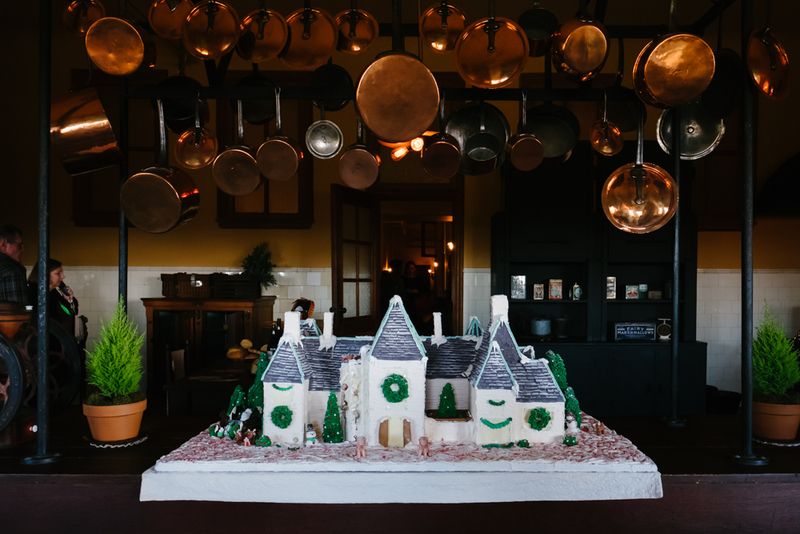 Christmas in Biltmore’s kitchen, with a replica gingerbread house. One of my favorite parts of the estate was the huge conservatory! You’ll find plenty of nooks of the conservatory decorated for Christmas, and of course there’s tons of tropical plants throughout–it’s such a paradise in the winter. During November and December, Biltmore offers special events like bonfires, and Candlelight Christmas Evenings with live music. We didn’t hand around to attend, but it’s worth looking into if you want the full Christmas experience. If you spend some time exploring the house and grounds, along with the winery, restaurants and shops, you could easily make a full day of it. Depending on how you’re booking your stay in Asheville, you may find that you can get a deal with Biltmore tickets included in the cost of your lodging or tour package. If you’re buying tickets separately, I do recommend checking their website beforehand to see which days they expect to be busier–on many days of the year, you can just show up, but some days require pre-purchased tickets.